A natural herbal concentrate for the stimulation of Metal-element organ function within the Energyvet Pentagram scheme. Its mechanism of action is based upon mild excitation of the lungs, the colon, skin and connective tissue, stimulating these organs or tissues towards increased activity. It generally enhances the immunity of the animal. Bio-information of the product-specific homeopathic type complements and potentiates the effect of the included herbs. The product stimulates the function of organs and tissues belonging to the next element, Water, i.e. the kidneys, lymphatic system, immune system (production of antibodies), urinary tract, and sexual organs. It calms down excessive energy and hyperactivity of the previous element of Earth, i.e. of the spleen, pancreas, stomach, nervous system and all functional organ tissues. - Warts, papillomas (of viral origin) [Audivet]. - It enhances the immunity of mucous membranes, bones as well as other tissues against negative effects [Skelevet]. - The production of antibodies (in infections, after vaccination) [Omegavet]. - Urine production in kidney failure with low volume of urine [Probiovet]. - The lymphatic system, clearing lymphatic flow [Fytovet]. - The immunity of sexual organ mucosa [Skelevet]. - It enhances immunity against emotional, mental influences [Fytovet]. - Excessive production of gastric juices [Fytovet]. - Inflammations of the pancreas and spleen accompanied by fever [Imunovet]. - Inflammation of the nerves (cold- and draught-induced) [Imunovet]. - Excessive production of watery secrets. - It reduces excessive care of the mother for the young, already symptomatic false gestation [Fytovet]. Do not administer in cases of advanced lung inflammations (with coughing), colon inflammations and skin conditions. Do not exceed the recommended daily dose! Ensure sufficient intake of water in the course of product usage. Contains traces of quinine – do not administer for at lest 1 week before races. Not suitable for gestating females. Keep out of reach of children! 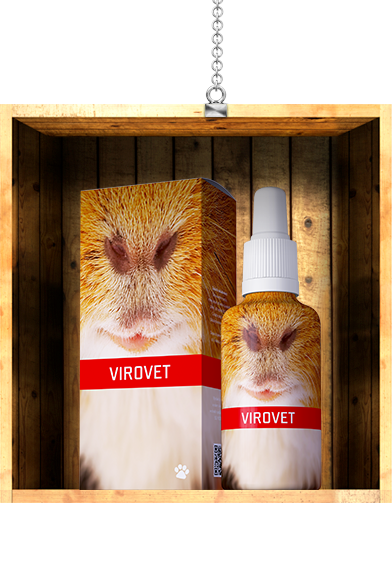 For me, Virovet is indispensable at the onset of any viral infection when the symptoms are limited to sneezing and increased temperature only. In this stage of the infection, a mere 2-3-day application is successful for the complete infection management. Another method of use of the product is as the main product where wart-like skin lesions occur. Local application of Audivet in these cases potentiates its effect.